In 1913, Franz Torek, a German-born surgeon, performed the first thoracic esophagectomy for cancer in the German (now Lenox Hill) Hospital in New York City. Although advised against performing such a procedure, Torek was successful in part because of the recent developments in intratracheal anesthesia and asepsis. Over the next several decades, open surgical esophagectomy developed as an acceptable treatment for benign disease as well as esophageal cancer. In 1989, interest in laparoscopic surgical techniques was sparked, as the first laparoscopic cholecystectomy was performed. This technique was first adapted into the field of esophageal disease in 1991 with laparoscopic fundoplication, performed by Dallemagne et al. With this, the shift toward minimally invasive esophageal surgery began. Dallemagne et al performed the first mini-invasive subtotal esophagectomy in 1992, using both thoracoscopy (for dissecting the esophagus) and laparoscopy (for the gastroplasty). The first esophagectomy performed completely via laparoscopy through a transhiatal approach was in 1995 by DePaul et al. In 1999, Watson et al described a completely minimally invasive Ivor Lewis technique. Subsequently, robotic-assisted approaches were described [11, 12] (see the video below). Advantages of robotic-assisted minimally invasive surgery. Video courtesy of Memorial Sloan-Kettering Cancer Center, featuring Inderpal S Sarkaria, MD. An increasing trend exists for many high-volume institutions to use MIE in treatment of Barrett disease with high-grade dysplasia and in patients with small resectable lesions that have limited nodal involvement (N0-1). This includes T1 (invasion of the lamina propria or submucosa), T2 (invasion of the muscularis propria), and some instances of T3 lesions (invasion of the adventitia). Neoadjuvant chemoradiation is not a contraindication for MIE. [20, 21] For more information, see Esophageal Cancer Guidelines. Currently, no standardized contraindications exist regarding the use of MIE. However, T4 lesions (invasion of surrounding tissues) are generally not amenable to any form of surgical resection. Extensive nodal disease and metastatic disease are also advanced stages that may require an open surgical approach or even endoscopic stenting for palliation instead of an attempt at MIE. Furthermore, any patient with a lesion that bridges the esophagogastric junction may not be considered a candidate for this approach unless the gastric margin can be cleared and an esophagogastrectomy can be done either via open approach or minimally invasively. In another analysis of 41 elderly patients over the age of 75 years who underwent minimally invasive esophagectomy, no operative deaths occurred, with a survival of 81% at 20 month follow-up. These findings suggest that MIE can be safely performed in selected patients and even those considered high-risk that might not otherwise be considered for an open surgery. Other outcome improvements seen with minimally invasive esophagectomy include decreased ICU and hospital length of stay, decreased blood loss, and operating times. In particular, Luketich et al reported a median ICU stay of 1 day and a total length of hospital stay of 7 days, compared with the average hospital stay of 16.6 days in the open approach. 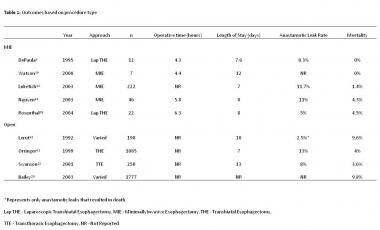 Operating room times in the same study averaged 306 minutes, whereas the average for an open procedure is 336 minutes. [22, 24] Similar results can be seen in multiple other series as compared to open procedures (see the table below). Outcomes based on procedure type. Complications and outcomes are significantly influenced by the volume of patients, because a large learning curve exists. High-volume centers tend to have more experience and, therefore, better outcomes than smaller-volume hospitals. Wang et al carried out a propensity score-matched comparison of MIE and open esophagectomy with respect to outcomes, quality of life, and survival in patients with squamous cell carcinoma. They found that MIE was associated with a shorter operating time (191 ± 47 minutes vs 211 ± 44 minutes), reduced blood loss (135 ± 74 mL vs 163 ± 84 mL), a similar lymph node harvest (24.1 ± 6.2 vs 24.3 ± 6.0), a shorter postoperative hospital stay (11 days vs 12 days), a lower rate of major complications (30.4% vs 36.9%), a lower rate of readmission to the intensive care unit (ICU; 5.6% vs 9.7%), and comparable perioperative mortality. van der Sluis et al assessed the long-term oncologic results of robot-assisted minimally invasive thoracolaparoscopic esophagectomy (RAMIE) with two-field lymphadenectomy in 108 patients with potentially resectable esophageal cancer. They found RAMIE to be oncologically effective and capable of providing good local control with a low percentage of local recurrence at long-term follow-up. Chang AC, Ji H, Birkmeyer NJ, Orringer MB, Birkmeyer JD. Outcomes after transhiatal and transthoracic esophagectomy for cancer. Ann Thorac Surg. 2008 Feb. 85(2):424-9. [Medline]. Connors RC, Reuben BC, Neumayer LA, Bull DA. Comparing outcomes after transthoracic and transhiatal esophagectomy: a 5-year prospective cohort of 17,395 patients. J Am Coll Surg. 2007 Dec. 205 (6):735-40. [Medline]. Brewer LA 3rd. History of surgery of the esophagus. Am J Surg. 1980 Jun. 139 (6):730-43. [Medline]. Dubecz A, Schwartz SI. Franz John A. Torek. Ann Thorac Surg. 2008 Apr. 85 (4):1497-9. [Medline]. Vierra M. Minimally invasive surgery. Annu Rev Med. 1995. 46:147-58. [Medline]. Dallemagne B, Weerts JM, Jehaes C, Markiewicz S, Lombard R. Laparoscopic Nissen fundoplication: preliminary report. Surg Laparosc Endosc. 1991 Sep. 1 (3):138-43. [Medline]. Morse CR, Shende MR, Luketich JD. Video-assisted esophageal resection. Shields TW, LoCicero J, Reed CE, Feins RH, eds. General Thoracic Surgery. 7th ed. Philadelphia: Lippincott Williams & Wilkins; 2009. 140: 1801-18. Dallemagne B, Weerts JM, Jehaes C, Markiewicz S, Bona S, Hosselet JL, et al. Case report: subtotal oesophagectomy by thoracoscopy and laparoscopy. Minimally Invasive Therapy. 1992. 1 (2):183-5. DePaula AL, Hashiba K, Ferreira EA, de Paula RA, Grecco E. Laparoscopic transhiatal esophagectomy with esophagogastroplasty. Surg Laparosc Endosc. 1995 Feb. 5 (1):1-5. [Medline]. Watson DI, Davies N, Jamieson GG. Totally endoscopic Ivor Lewis esophagectomy. Surg Endosc. 1999 Mar. 13 (3):293-7. [Medline]. Okusanya OT, Sarkaria IS, Hess NR, Nason KS, Sanchez MV, Levy RM, et al. Robotic assisted minimally invasive esophagectomy (RAMIE): the University of Pittsburgh Medical Center initial experience. Ann Cardiothorac Surg. 2017 Mar. 6 (2):179-185. [Medline]. [Full Text]. Lin MW, Lee JM. Robotic-assisted minimally invasive esophagectomy: is it advantageous over thoracoscopic esophagectomy?. J Thorac Dis. 2017 Mar. 9 (3):490-491. [Medline]. [Full Text]. Shah R, Jobe BA. Open versus minimally invasive esophagectomy: what is the best approach? Minimally invasive esophagectomy. J Gastrointest Surg. 2011 Sep. 15 (9):1503-5. [Medline]. Luketich JD, Fernando HC, Christie NA, Buenaventura PO, Keenan RJ, Ikramuddin S, et al. Outcomes after minimally invasive esophagomyotomy. Ann Thorac Surg. 2001 Dec. 72 (6):1909-12; discussion 1912-3. [Medline]. Pierre AF, Luketich JD, Fernando HC, Christie NA, Buenaventura PO, Litle VR, et al. Results of laparoscopic repair of giant paraesophageal hernias: 200 consecutive patients. Ann Thorac Surg. 2002 Dec. 74 (6):1909-15; discussion 1915-6. [Medline]. Krasna MJ, Jiao X. Thoracoscopic and laparoscopic staging for esophageal cancer. Semin Thorac Cardiovasc Surg. 2000 Jul. 12 (3):186-94. [Medline]. Luketich JD, Schauer P, Landreneau R, Nguyen N, Urso K, Ferson P, et al. Minimally invasive surgical staging is superior to endoscopic ultrasound in detecting lymph node metastases in esophageal cancer. J Thorac Cardiovasc Surg. 1997 Nov. 114 (5):817-21; discussion 821-3. [Medline]. Pennathur A, Zhang J, Chen H, Luketich JD. The "best operation" for esophageal cancer?. Ann Thorac Surg. 2010 Jun. 89 (6):S2163-7. [Medline]. Sihag S, Kosinski AS, Gaissert HA, Wright CD, Schipper PH. Minimally Invasive Versus Open Esophagectomy for Esophageal Cancer: A Comparison of Early Surgical Outcomes From The Society of Thoracic Surgeons National Database. Ann Thorac Surg. 2016 Apr. 101 (4):1281-8; discussion 1288-9. [Medline]. Maloney JD, Weigel TL. Esophagectomy. Chen H, ed. Illustrative Handbook of General Surgery. New York: Springer; 2010. 1: 99-107. Litle VR, Luketich JD. Minimally invasive esophagectomy. CTSNet. Available at https://www.ctsnet.org/article/minimally-invasive-esophagectomy-0. August 19, 2008; Accessed: July 21, 2017. Luketich JD, Alvelo-Rivera M, Buenaventura PO, Christie NA, McCaughan JS, Litle VR, et al. Minimally invasive esophagectomy: outcomes in 222 patients. Ann Surg. 2003 Oct. 238 (4):486-94; discussion 494-5. [Medline]. Luketich JD, Pennathur A, Awais O, Levy RM, Keeley S, Shende M, et al. Outcomes after minimally invasive esophagectomy: review of over 1000 patients. Ann Surg. 2012 Jul. 256 (1):95-103. [Medline]. Traverso LW, Shinchi H, Low DE. Useful benchmarks to evaluate outcomes after esophagectomy and pancreaticoduodenectomy. Am J Surg. 2004 May. 187 (5):604-8. [Medline]. Nguyen NT, Roberts P, Follette DM, Rivers R, Wolfe BM. Thoracoscopic and laparoscopic esophagectomy for benign and malignant disease: lessons learned from 46 consecutive procedures. J Am Coll Surg. 2003 Dec. 197 (6):902-13. [Medline]. Perry Y, Fernando HC, Buenaventura PO, et al. Minimally invasive esophagectomy in the elderly. JSLS. 2002. 6:299-304. [Medline]. [Full Text]. Wang H, Shen Y, Feng M, Zhang Y, Jiang W, Xu S, et al. Outcomes, quality of life, and survival after esophagectomy for squamous cell carcinoma: A propensity score-matched comparison of operative approaches. J Thorac Cardiovasc Surg. 2015 Apr. 149 (4):1006-1015.e4. [Medline]. van der Sluis PC, Ruurda JP, Verhage RJ, van der Horst S, Haverkamp L, Siersema PD, et al. Oncologic Long-Term Results of Robot-Assisted Minimally Invasive Thoraco-Laparoscopic Esophagectomy with Two-Field Lymphadenectomy for Esophageal Cancer. Ann Surg Oncol. 2015 Dec. 22 Suppl 3:S1350-6. [Medline]. Luketich JD, Pennathur A, Franchetti Y, Catalano PJ, Swanson S, Sugarbaker DJ, et al. Minimally invasive esophagectomy: results of a prospective phase II multicenter trial--the Eastern Cooperative Oncology Group (E2202) study. Ann Surg. 2015 Apr. 261 (4):702-7. [Medline]. Michelet P, D'Journo XB, Roch A, Doddoli C, Marin V, Papazian L, et al. Protective ventilation influences systemic inflammation after esophagectomy: a randomized controlled study. Anesthesiology. 2006 Nov. 105 (5):911-9. [Medline]. Ng JM. Update on anesthetic management for esophagectomy. Curr Opin Anaesthesiol. 2011 Feb. 24 (1):37-43. [Medline]. Ng JM. Perioperative anesthetic management for esophagectomy. Anesthesiol Clin. 2008 Jun. 26 (2):293-304, vi. [Medline]. Bartels H, Stein HJ, Siewert JR. [Early extubation vs. late extubation after esophagus resection: a randomized, prospective study]. Langenbecks Arch Chir Suppl Kongressbd. 1998. 115:1074-6. [Medline]. Cense HA, Lagarde SM, de Jong K, Omloo JM, Busch OR, Henny ChP, et al. Association of no epidural analgesia with postoperative morbidity and mortality after transthoracic esophageal cancer resection. J Am Coll Surg. 2006 Mar. 202 (3):395-400. [Medline]. Kent MS, Schuchert M, Fernando H, Luketich JD. Minimally invasive esophagectomy: state of the art. Dis Esophagus. 2006. 19 (3):137-45. [Medline]. Luketich JD, Nguyen NT, Weigel T, Ferson P, Keenan R, Schauer P. Minimally invasive approach to esophagectomy. JSLS. 1998 Jul-Sep. 2 (3):243-7. [Medline]. Wee JO, Bizekis C, Luketich JD. Minimally invasive esophagectomy. Sugarbaker DJ, Bueno R, Krasna MJ, et al, eds. Adult Chest Surgery. New York: McGraw-Hill Professional; 2009. Benzoni E, Bresadola V, Terrosu G, Uzzau A, Cedolini C, Intini S, et al. Minimally invasive esophagectomy: a comparative study of transhiatal laparoscopic approach versus laparoscopic right transthoracic esophagectomy. Surg Laparosc Endosc Percutan Tech. 2008 Apr. 18 (2):178-87. [Medline]. Palanivelu C, Prakash A, Parthasarathi R, Senthilkumar R, Senthilnathan PR, Rajapandian S. Laparoscopic esophagogastrectomy without thoracic or cervical access for adenocarcinoma of the gastroesophageal junction: an Indian experience from a tertiary center. Surg Endosc. 2007 Jan. 21 (1):16-20. [Medline]. Avital S, Zundel N, Szomstein S, Rosenthal R. Laparoscopic transhiatal esophagectomy for esophageal cancer. Am J Surg. 2005 Jul. 190 (1):69-74. [Medline]. Jobe BA, Kim CY, Minjarez RC, O'Rourke R, Chang EY, Hunter JG. Simplifying minimally invasive transhiatal esophagectomy with the inversion approach: Lessons learned from the first 20 cases. Arch Surg. 2006 Sep. 141 (9):857-65; discussion 865-6. [Medline]. Hoppo T, Jobe BA, Hunter JG. Minimally invasive esophagectomy: the evolution and technique of minimally invasive surgery for esophageal cancer. World J Surg. 2011 Jul. 35 (7):1454-63. [Medline]. Levy RM, Wizorek J, Shende M, Luketich JD. Laparoscopic and thoracoscopic esophagectomy. Adv Surg. 2010. 44:101-16. [Medline]. Orringer MB, Marshall B, Iannettoni MD. Transhiatal esophagectomy for treatment of benign and malignant esophageal disease. World J Surg. 2001 Feb. 25 (2):196-203. [Medline]. Swanson SJ, Batirel HF, Bueno R, Jaklitsch MT, Lukanich JM, Allred E, et al. Transthoracic esophagectomy with radical mediastinal and abdominal lymph node dissection and cervical esophagogastrostomy for esophageal carcinoma. Ann Thorac Surg. 2001 Dec. 72 (6):1918-24; discussion 1924-5. [Medline]. Bailey SH, Bull DA, Harpole DH, Rentz JJ, Neumayer LA, Pappas TN, et al. Outcomes after esophagectomy: a ten-year prospective cohort. Ann Thorac Surg. 2003 Jan. 75 (1):217-22; discussion 222. [Medline]. Brown AM, Pucci MJ, Berger AC, Tatarian T, Evans NR 3rd, Rosato EL, et al. A standardized comparison of peri-operative complications after minimally invasive esophagectomy: Ivor Lewis versus McKeown. Surg Endosc. 2018 Jan. 32 (1):204-211. [Medline]. Minimally invasive esophagectomy. Thoracoscopic port sites for transthoracic approach. Minimally invasive esophagectomy. Mobilization of thoracic esophagus using Penrose drain. Minimally invasive esophagectomy. Abdominal port sites for laparoscopy. Minimally invasive esophagectomy. Pyloroplasty during laparoscopy. Minimally invasive esophagectomy. Mobilization of stomach. Minimally invasive esophagectomy. Completed reconstruction with gastric conduit. Minimally invasive esophagectomy. Dissection of esophagus using inversion technique. Robotic-assisted esophagectomy: part 1. Video courtesy of Memorial Sloan-Kettering Cancer Center, featuring Inderpal S Sarkaria, MD. Robotic-assisted esophagectomy: part 2. Video courtesy of Memorial Sloan-Kettering Cancer Center, featuring Inderpal S Sarkaria, MD. Robotic-assisted esophagectomy: part 3. Video courtesy of Memorial Sloan-Kettering Cancer Center, featuring Inderpal S Sarkaria, MD. Robotic-assisted esophagectomy: part 4. Video courtesy of Memorial Sloan-Kettering Cancer Center, featuring Inderpal S Sarkaria, MD. Robotic-assisted esophagectomy: part 5. Video courtesy of Memorial Sloan-Kettering Cancer Center, featuring Inderpal S Sarkaria, MD. Robotic-assisted esophagectomy: part 6. Video courtesy of Memorial Sloan-Kettering Cancer Center, featuring Inderpal S Sarkaria, MD. Robotic-assisted esophagectomy: part 7. Video courtesy of Memorial Sloan-Kettering Cancer Center, featuring Inderpal S Sarkaria, MD. Minimally invasive esophagectomy. Room setup and port placement. Video courtesy of Memorial Sloan-Kettering Cancer Center, featuring Inderpal S Sarkaria, MD.